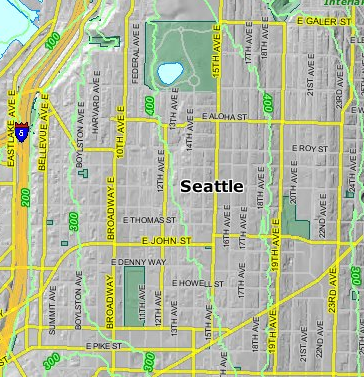 Driving: If you’re going to drive, check out the SDOT Winter Weather map. It shows which routes have been recently been de-iced or salted. There are also a few notorious streets to avoid including John between Broadway and 15th and E Aloha. Commenters will probably know more. You can also check the CHS Street Cams page before you head out. And the CHS Weather page has the latest reports from local observations. Capitol Hill Station is a fully operational snow battle station. Sound Transit says it works to maintain “normal light rail service” during inclement weather, “although minor delays can occur.” It might also continue to operate trains overnight after the close of passenger service to prevent ice from forming on the tracks. The First Hill Streetcar can operate in snow not deeper than four inches. “If it surpasses that we will suspend operations,” a spokesperson tells CHS. You might also see a “freeze-train” that creates surface friction to keep the rails above freezing during low temperatures below 32 degrees. Car2Go, Reach Now, ZipCar: We’re checking. Here’s how Car2Go deals with staying out the way of the plows in Minnesota. In anticipation of cold temperatures, the Seattle Human Services Department has opened the emergency co-ed adult shelter at the Seattle Center Pavilion (305 Harrison St.) through Thursday, December 8th. This shelter will be open from 7 p.m. to 7 a.m. and has room for 100 people. Many, of course, won’t be able to take advantage of it or will choose not to. Call 911 if you see somebody who appears to be in distress on the streets at any time — but especially when temperatures hover around freezing. Public schools: You can find closure alerts here. Unless the rain forecasted for overnight Thursday never materializes, Friday morning should bring regular start times. Airport: The FAA’s Sea-Tac status page is here. Best place to sled (mostly safely) are these CHS Volunteer Park Sled Runs. If it gets nuts, sledding down Denny is part of Capitol Hill legend. Watch out for moving cars of course but some of the most serious injuries come from hitting parked cars. Be careful. More places not to even think about driving? Here is a list of the steepest streets in Seattle. This seems like a good place to mention: If you’re out walking, even on slow-traffic streets, don’t assume cars stopping at intersections can stop. They may not know they can’t stop. Don’t walk into the crosswalk till all cars have stopped. Thanks for the reminder to all about pedestrian safety. Today I saw a pedestrian make a very understandable but potentially deadly mistake. She was waiting to cross at a crosswalk uncontrolled by a light. I stopped, and she looked at me, smiled, and stepped off the curb without looking to her left, into the path of an oncoming truck. When she saw the look on my face, she quickly looked left and was able to get back the curb. The truck was also able to stop. If there would have been ice or snow, it could have been different. I walk all the time, so I know how easy it can be to let your guard down. Especially in this weather, remember to focus, make eye contact with drivers when you cross, look both ways, and double check the lane you are stepping into. Drivers have a legal obligation to stop, but the above measures can go a very long way to keeping you safe. Good advice! Every time I watch one of those YouTube videos of cars sliding down the CH hills in the snow, I’m shocked at how casual so many pedestrians are. Those cars are like missiles! No one is there to protect you from them. There’s also a domino effect that makes them extra-upredictable, once they begin slamming into each other. also, after you are done sledding on denny way; clean up your trash. At least the snow hid the needles, for a short time.